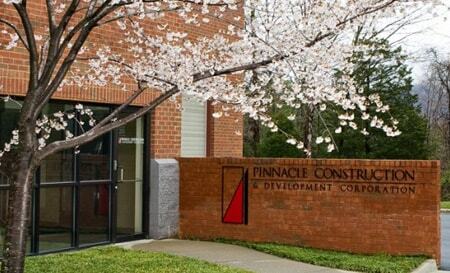 Pinnacle Construction & Development Corp. is a Virginia construction developer based out of Charlottesville, serving Central Virginia and beyond. Pinnacle has developed and constructed Multi-Family, Commercial, Mixed-Use, Medical, Historic Restoration, and Senior Living Facilities across Virginia. Pinnacle was founded on the philosophy that a General Contractor with a strong design and real estate development background can enhance the value of any client's project, by more efficiently and effectively transferring the design, financial, and entitlement process to the building construction project at hand. This philosophy becomes apparent upon review of Pinnacle's Virginia construction projects which have won both state and national awards for building construction and development excellence. "It is important to understand that buildings are built investments. A well-crafted delivery system is the first step toward a well-designed and well-executed building." The concept of integrated decision making, as contrasted with linear decision making, is to bring the key parties together early to combine their expertise and accelerate the overall design/construction process. This results in a construction project that is better controlled in regard to time, quality, safety and cost. Because Pinnacle Construction & Development Corp. and affiliates own, develop, construct, and manage similar construction projects and compete regularly in the open bid market, they have considerable knowledge of the cost of work in the marketplace. The initial conceptual estimate and all refinements are based upon proven productivity rates, current local wages and material prices, along with current subcontractor practices. In addition to the local economy, Pinnacle Construction & Development Corp. canvasses the regional and national markets to achieve economies for the project. To ensure the accuracy of the estimate, Pinnacle Construction & Development Corp. utilizes a team of qualified professionals who have extensive industry experience. Their market knowledge allows for the development of a highly accurate, market-specific, customized, and finely detailed estimate through the use of an extensive database of historical cost and pricing data, as well as market specific adjustment factors. Pinnacle's President, William Park, is the current President of the Virginia Tech Program in Real Estate Advisory Board. In addition to providing financial support to the Program in Real Estate, members of the Advisory Board advise the director curriculum and fundraising, mentor students, attend job and internship fairs, serve as guest lecturers in the classroom and at Real Estate Society meeting, in addition to many other contributions. As a part of such a trailblazing program, Mr. Park is aiding in delivering a diverse education necessary to understand the real estate industries complexities. For more information regarding the Virginia Tech Program in Real Estate, please click here. Mr. Park is also a member of the Virginia Housing Development Authority (VHDA) Rental Advisory Board. Since its inception in 2002, this VHDA Advisory Board has become an essential affordable housing stakeholder group that has provided guidance in establishing criteria for mixed use/mixed income projects; reviewed and endorsed changes to the Qualified Allocation Plan; contributed developer perspective regarding leaseholder policy; and evaluated and commented on parameters for premature bond retirement. The Rental Advisory Board is comprised of Developers and local government representatives. For more information regarding the Rental Advisory Board, please click here. Pinnacle's affiliate companies Bluestone Land LLC, Park Properties Management Company LLC, and Bluestone Capital Advisors LLC are commercial building development, real estate asset management, and mortgage bank firms respectively, with construction projects throughout the state of Virginia. These building construction projects are primarily multi-family residential, commercial office, mixed use, and commercial developments.